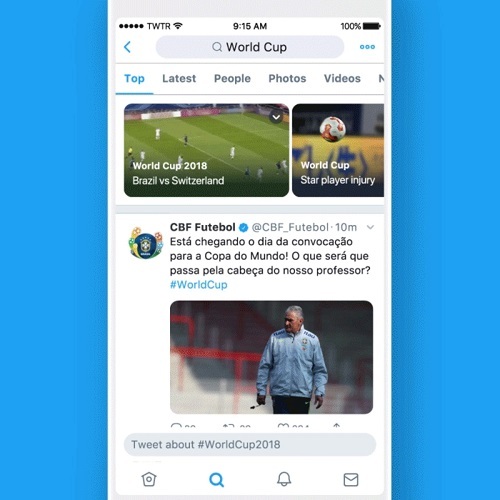 While Twitter has continued to expand its push into live-stream video coverage and programming, one of its issues in generating more significant traction for such content has been discovery, and letting people know what's on and how they can tune in. For the most part, such notifications are reliant on users following the right profiles - for example, Twitter broadcast selected WNBA games live during the most recent season, which I would have watched more of, had I known when. But because I don't follow the WNBA handle, I wasn't always aware of them. The simple answer, of course, would be for me to just follow the relevant accounts, but that's not really ideal either, as some of the accounts which broadcast content I might be interested in also tweet things I don't need to know about. Given this, and for Twitter to maximize its viewership, there really should be an easier way for people to get a quick understanding of what's being broadcast, whenever they have the time to watch. Catch breaking news, your favorite personalities, and can't-miss sports moments. Rolling out now on iOS and Android. So now, when an account you follow begins a broadcast, Twitter will highlight it right at the top of your feed. Which is good, and will no doubt get more people watching. But its still not the real solution Twitter needs to get more people viewing its streaming video content. Twitter has tried other options on this front. They added 'Topic Tabs' to the Explore page back in June which highlight trending conversations - and can include live streams - at the top of the Explore page. They also tried out another variation of this last year, which put more focus on in-progress live-streams within Explore. But as yet, Twitter hasn't quite been able to nail live-stream discovery, and boost exposure for the option. This new initiative is probably the biggest step they've taken, which shows that they're still working on it, and it'll be interesting to see whether it increases viewer numbers or overall platform engagement. And from a marketing perspective it could be particularly interesting - now, live-streams will occupy more prominent space in the app screen, which could make it a more appealing option for businesses to consider. Having the option to get your streams shown right in front of your followers' eyes could help raise brand awareness, and get people interacting with your content. But really, what the addition clearly suggests is that you can expect to see more live-stream content notifications in your Twitter streams moving forward. 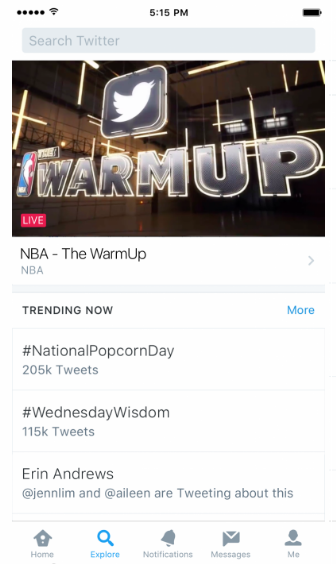 You would expect that this presentation option will get more people watching, and if it does, that will spur Twitter to keep pushing ahead, finding new ways to boost exposure for live content. The new live notifications are rolling out now on both iOS and Android.